Little Mrs. Married: Broccoli & Cheese Omelet! Delish! I have never made omelettes before. Ever. Until today! I have been following Gina's Weight Watcher Recipes for awhile now & today i finally got a chance to try one of her ideas! I made a few variations of my own & it was quite delish!! You should definitely check out her site & try out some of her stuff! By the way, i am not on Weight Watchers, but i know that if her goal is to make dishes low in points, then they will naturally also be lower in calories. Her pictures always look AMAZING & i am going to continue to use her recipes! You should, too! I also included chopped turkey sausage because we had some that needed to be used before it went bad! 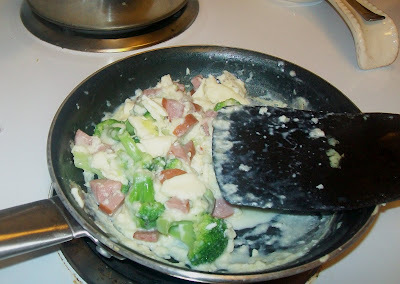 My "omelet" - i used a smaller pan & couldn't flip it right - so it's more of a scramble! Still delish! Same as Brad's except 1 egg/2 eggwhites instead of 3 eggs. 1 serving/takes no time at all to make. 5 minutes each, i'd guess. In a small bowl, beat eggs, egg whites, salt, pepper & milk. In a medium non-stick skillet on medium heat, spray the pan lightly with oil. When skillet is warm, add the eggs, rotating pan to completely cover. Reduce heat to low flame. 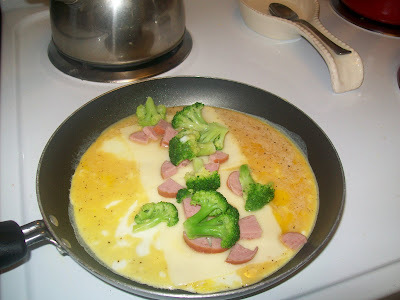 Lay the cheese down int he center of the eggs & top with broccoli & chopped turkey sausage. When the eggs are set, flip the sides over to the center to create your omelet. And that's it! Delish!! Thank you, Gina, for your fantastic recipe!You can look at hers here. & check out her pics, her omelet looks SO much better than mine! Looks really good! I prefer my breakfast sweet though :) that blog has great recipes! thank you for sharing!